With the Wimbledon tournament starting on Monday and temperatures rocketing into the high twenties, what better time to change up your early summer fragrance wardrobe? Launching last summer, Renshaw by Murdock London honours the great British traditions of tennis, croquet and the sporting games of the well-manicured lawn. Murdock themselves boast Renshaw being a nod to the legendary Wimbledon cup. Renshaw starts off very green and almost a little aquatic with that sparkling Bergamot and Mint. The Gardenia, Lily of the Valley follow through with winks and nods to the Violet and Strawberry. The most prominent base notes are the white woods, which give it a little depth, but this is a cologne rather than an EDT. Renshaw is light, friendly, celebratory yet distinguished. Worn over linen, this is a fabulous summer cologne and a word to the wise, that top note of bergamot will keep the little biting beasties away. Strawberries and cream anyone? Murdock Renshaw is available in a 100ml cologne for £90 and a 50-hour glass candle with solid metal lid for £35. This was a total surprise as for me, Lacoste fragrances have never really shone out from the crowd of those lining the walls of Duty Free or Boots. Lacoste Jaune Yellow on the other hand is really quite delicious. Lacoste Jaune Yellow immediately starts off with that common alcohol and apple/grapefuit blast that you find with so many men’s scents, but wait! A few moments later it dries down to an almost creamy yet juicy and bright accord with a smooth cypress and amber base. Lacoste Yellow is bright, fresh, delicious and sporty yet seductively smooth; this is definitely one for your hand luggage this summer. 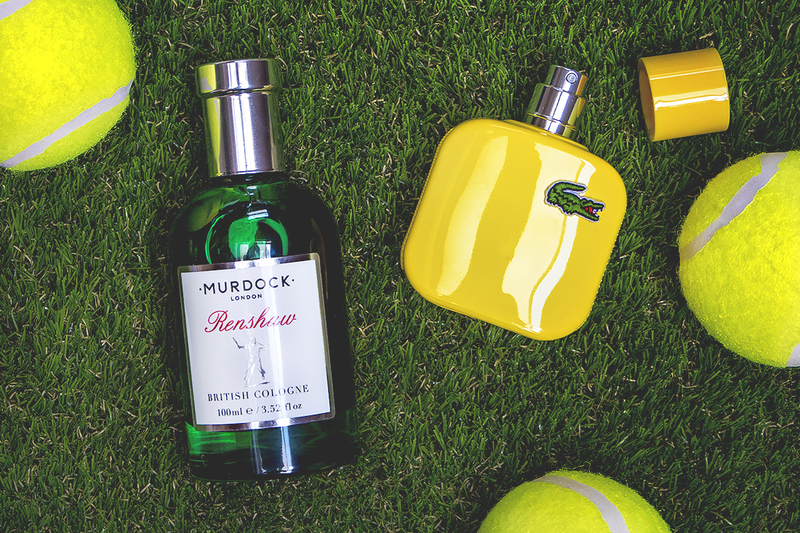 Going back to Murdock London’s Renshaw, in celebration of the start of the Wimbledon tennis tournament, I’m super-excited to be able to give away three sets of the Renshaw cologne and candle. The giveaway will run until Friday 10th July and is open to UK residents only. Simply enter using the Rafflecopter box below! Good luck. This article first appeared on MANFACE written by Thom Watson. It was published on Saturday 27th June 2015 and was last updated on Monday 3rd April 2017 at 1:25pm. It's categorised under Aromatic Fragrance, Lacoste, Murdock London where you'll find more related content. For a unique smell, this murdocks got. And it does not Lacoste a lot…..